HOW DOES OSA CAUSE GERD? Have you ever awakened in the middle of the night choking on acid because you’ve inhaled it and can’t breathe? You try taking in a breath and all you get is a burning in your throat and lungs. You try to expel it but it takes many tries and coughing, burning, burning. You panic, thinking, “Am I going to die?” You possibly could if you hadn’t woken up! Secondary effects of Obstructive Sleep Apnea, resulting from the GERD, are esophagus and larynx damage, aspiration pneumonia, permanent lung damage, tooth erosion, and tooth sensitivity. 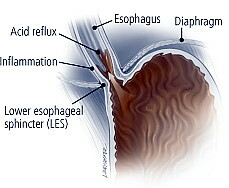 GERD, or Acid Reflux, is a digestive disorder affecting the lower or reflux esophageal sphincter (LES), the muscle connecting the esophagus and stomach. The LES is a high-pressure zone that acts as a barrier to protect the esophagus against the back flow of gastric acid from the stomach. Normally, the LES works something like a dam, opening to allow food to pass into the stomach and closing to keep food and acidic stomach juices from flowing back into the esophagus. Gastroesophageal reflux occurs when the LES relaxes when it shouldn’t or becomes weak, allowing contents of the stomach to flow up into the esophagus. Overweight people and pregnant women may suffer more heartburn episodes because increased abdominal pressure contributes to reflux. Pregnant women are also more prone to heartburn because the LES relaxes in response to the high levels of the hormone progesterone that occur with pregnancy. Generally, though, GERD is uncommon in people under age 40. Smoking can irritate the entire GI tract. Frequent sucking on a cigarette causes air to be swallowed, increasing stomach pressure and encouraging reflux. Smoking sometimes also relaxes the LES muscle. Have you ever woken in the middle of the night choking on acid because you’ve inhaled it and can’t breathe? Try taking in a breath and all you get is a burning in your throat and lungs. You try to expel it but it takes many tries and coughing, burning, burning. You panic, thinking, “Am I going to die?” You possibly could if you hadn’t woken up! This is what people with GERD (Gastro-Esophageal Reflux Disease) experience many times if they have eaten a spicy meal, eaten too close to bedtime, did not raise their head higher than their body while sleeping, or have SLEEP APNEA. As a victim of OSA (Obstructive Sleep Apnea) myself, I have experienced this nightmarish incident many times. Fortunately, as I received treatment for OSA, my Acid Reflux, and other systemic disorders, has subsided. Sleep apnea, of course, is the cessation of breathing for over 10 seconds and up to 90 seconds, repeated many times while sleeping. Snoring is the warning alert. How it happens: During the cessations of breathing the body will increase its efforts to take in air. Abdominal contractions are exaggerated and increase until breathing resumes. Secondary effects of OSA, resulting from the GERD, are esophagus and larynx damage, aspiration pneumonia, permanent lung damage, tooth erosion, and tooth sensitivity. Solutions: People may take medications to control symptoms of GERD, and this helps, but OSA (obstructive sleep apnea) can override the effects of the proton-pump inhibitor (Omeprazole), or other OTC drugs. Patients in the dental office can be easily screened for OSA at the initial oral exam. Tooth erosion is one consequence, bruxism is another. A sleep questionnaire and other signs of sleep apnea will prompt the need for a HSS (home sleep study). This will determine the diagnosis of OSA and the severity. By treating the sleep apnea we can save teeth and possibly the patient’s life. It’s so important to treat the sleep apnea for many reasons. GERD is just one of them. One out of 3 people have a sleep disorder. Everyone knows someone with sleep apnea and a story to tell about it. Shouldn’t we as dental professionals help our patients have healthier teeth and live longer? Get involved for profit, prestige, and the great feeling of saving lives: Hygienists around the country are screening for OSA and dentists are treating it with oral appliances. They gain the satisfaction of truly helping patients, their family members and possibly themselves. At RDH Sleep Solutions on LinkedIn, we are dedicated to training hygienists in screening for sleep apnea and directing their dentists to include this vital service into their practices. We are connected to the largest OSA training organization and offer deep discounts for hygienist-directed/dentist enrollment.